In this page, we provide a detailed review of Advanzia Mastercard Gold Credit Card. This Gold Credit Card is one of the best free credit cards in Germany and highly recommended for newcomers expat and students to Germany. This article will provide you with details on how you can apply and make the best use the credit card to your advantage. On a first glance, the home page of the website might not have an immediately recognizable brand name. But don’t be mistaken by the simple landing page of the website. The Advanzia credit card is provided by Advanzia bank S.A.
Based in Luxembourg since 2005, Advanzia Bank SA has a banking license in Luxembourg and offers a free Advanzia credit card for residents in Germany, Austria, France and Luxembourg. The bank has about 1.2 million active Advanzia bank credit card customers. The credit card “Gebuhrenfrei Mastercard Gold”, which simply translated into German means “free of charge (or toll-free)” is not only free, but also includes a lot of other advantages such as free foreign usage without any transaction charges, free cash withdrawal, free travel insurance, and up to 7-week interest-free credit period on purchases. So what is the catch? Like all credit cards, it earns through interest rate on late payments. So, as long as you are financially prudent and stick to the repayment deadline, it is the best free credit card you can get. In addition, customers benefit from free travel insurance. Read below for the more details on how to best use the credit card. The requirements to apply for the Mastercard Gold card is only a residence address in Germany (Austria or France). Therefore, you can apply for this Advanzia credit card, irrespective of if you are employed, self-employed, unemployed or you are a student. This also includes expats and foreign students even if you have not lived in Germany for a long time can apply for this credit card. This makes it a perfect credit card for newcomers to Germany, including students. Although the credit limit might not be very high at the beginning, you can quickly build your credit history and get a higher credit limit in a few months. Furthermore, you can enjoy all the benefits of being a Mastercard Gold card customer. As long as you have an address in Germany and a personal bank account, you can get a credit card without the need for doing a PostIdent procedure. Advanzia bank will send you the credit card to your German address which verifies your address, and you will have to pay your credit card bill using your bank account, which proves your identity. Therefore, it does not require a full identification process such as PostIdent. This is especially useful for citizens whose passport are not accepted for PostIdent (e.g., Indian Passport). Keep a track of your billing cycles and pay the bills on time. We have provided an easy illustration to explain the billing cycles and when interest payments are charged. First, you should know your billing cycle of Advanzia Mastercard Gold credit card starts from 3rd of each month and ends the 2nd of the next month, and the deadline to pay each billing cycle month is the 20th of next month, and so on. So as an example, the billing cycle starts on 3.April to 2.May, the credit card statement is sent by email on the 3 May, and the deadline for payment is 20 May. When making a purchase, such as an airline ticket or eating out during the billing cycle, it is included in the statement and due on the 20th of the next month. So depending on when you make your card purchase, you will have between 20 days and 47 days interest-free period to make the payment as explained below. The Credit Card Bill is generated on the 3rd of each month and you will have to pay by the deadline of 20th of each month. You will get your credit card bill by email. You can also check it on your online account. You will have to actively make a transfer each month from your bank account to the Advanzia Credit Card account. It is not automatically deducted from your bank account. So, do not forget to make a transfer on time. To be safe, make an online transfer two working days before the deadline to avoid any interest charges. You cannot have a credit balance (i.e., deposit more money than you have to pay). That means you cannot keep your account in a positive with a credit balance on your credit card account. Deposits that exceed the card balance may be rejected. But you can make partial payments during the course of the period. Therefore, be a prudent user of the credit card and benefit from all the features of the free Mastercard Gold credit card. Step by step instructions on how to apply or Advanzia Mastercard Gold Free credit card in Germany with English translation application form and screenshots of the application process. Just fill out the online card application. Click here to apply a free Advanzia Bank Mastercard Gold. Enter the details in the next form to optimise the credit limit. Once you finish the application process, you will be sent a credit card which has to be activated. 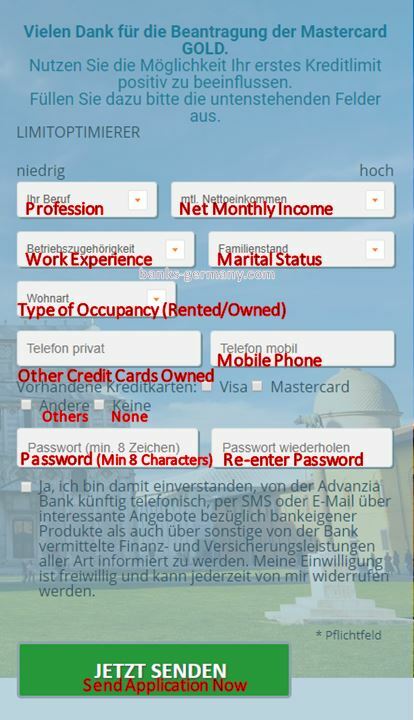 Here are the steps to activate the Advanzia bank credit card in Germany. After application, your data and the credit score (e.g. Schufa, CEG) are checked. On accepting your application, you will receive a welcome e-mail. Within 2-3 weeks from the time of application, you will get a personalized Free Mastercard Gold and a separable activation card, and postcard (credit card agreement). Sign the activation card and post it to Advanzia bank. The address is already mentioned on the postcard and the postage will be paid by Advanzia bank. Once Advanzia bank receives your signed Activation Card, your credit card will be activated and you will get a confirmation e-mail. Now, you can use the Toll-Free Mastercard Gold within your personal credit limit. You will shortly receive the PIN separately by post which you can use to withdraw from an ATM. The letter will also indicate your personal credit limit approved for you. When and how will you know your credit limit? Your personal credit limit will be provided for the first time together with your PIN. Also, this will be displayed on each of the credit card statements. How is the credit limit set? Your credit limit is based on your personal information that you specified in the request and set (if resident in Germany) based on the data provided by the Schufa / CEG or other agencies. If there are any changes to your personal information, please inform Advanzia Bank in writing. The credit limit may be somewhat lower at the beginning until the bank checks the payment pattern and customer relationship. However, after a few months if regular payments have been noted to be checked your credit limit may be increased. Another reason for a low credit limit may be missing or incomplete information during the application process. If you have entered incomplete data and incorrect personal data (occupational group, marital status, etc. ), you can update Advanzia Bank by e-mail or letter to update your data. You can make a maximum of 5 ATMs withdrawals within your credit limit or up to a maximum of € 1,000 a day. How can you reduce your credit limit? If you want to reduce your credit limit for safety or personal reasons, you can contact Advanzia Bank in writing (letter, e-mail) to adjust the credit limit. How to check your Advanzia Credit Card bill? You will receive your Credit card bill by e-mail on the 3rd of each month. If you have not received then check your spam messages. Alternatively, you can login to the online account anytime and also check your credit card statement online. Can you pay using automatic debit order? No, Advanzia bank does not allow automatic debit authorization of your credit card from your bank account. Since they offer the option of partial payments, Advanzia bank does not collect the invoice amount by direct debit from your account. This keeps you flexible and allows you to decide for yourself how much you want to transfer each month. But always remember to pay your credit card bill on time. How to pay Advanzia credit card bill? You will have to make a manual transfer each month from your bank account to your credit card account. The IBAN number where you should transfer is mentioned on your credit card bill. It is like a regular money transfer to a bank account. Just enter the IBAN details of Advanzia bank (personal for your credit card account) and transfer the due amount before the 20th of the month. It is important that you transfer the money from your own bank account. If you do not use your own bank account, you will have to make a full identification, eg by means of the PostIdent procedure, due to the Luxembourg anti-money laundering regulations. If you have sent us a copy of the ID card and at least one deposit has been made from your own account, the further transfers can also be made from a third party account. The PostIdent procedure applies if you do not have your own account to use for the transfer. Can you make deposits in between? Yes, you can make deposits in between and before the due date, either in full or in part. This is especially useful if you have a lower credit limit. By making a payment before time, you can make more purchases using your credit card. For example, your credit limit is €1000, and you buy a flight ticket for €800. You can immediately make the payment of €800 so that you can continue to utilize the full credit limit again within the same month. When is the travel insurance valid? If you have paid at least 50% of the total travel costs with an approved transport company with the Free Mastercard Gold and all other requirements are met by the insurance conditions shall automatically apply the protection of our free travel insurance. The cardholder and up to 3 other fellow passengers are insured for a period from 2 to 90 days. What does the travel insurance include? For whom travel insurance is valid? The insurance is valid for the credit card holder and their partners, children under 23 years who are resident at the same address or, if they live at their place of study, are supported financially by the cardholder. The insurance is also valid for your children (also adopted or foster children), although they live at a different address, but have previously lived with the cardholder. The insurance is also valid for up to 3 passengers travelling together. If the number of passengers is greater than 3, the youngest three are insured. This insurance also covers the passengers if they have the same itinerary, duration and stops similar to the cardholder. If family members and travelling companions accompany the cardholder on the trip, so the insurance company first applies to the family members. Do I have to pay ATM fees if I withdraw cash? Gold Mastercard is free of charge both for purchases and for cash withdrawals. In some cases, other banks ATM’S charge a small processing fee for using a foreign card. This fee may amount to EUR 2-5 per-cash transaction. In these cases, Advanzia Bank SA does not refund these fees since these processing fees are not incurred by them or sent to them. How can I avoid the processing fee by other banks for cash withdrawals? The machines operated by banks are obligated to inform the cardholder of the handling fee at the ATM, and the cardholder must agree to this charge BEFORE the cash withdrawal – otherwise, this transaction does not take place. If you notice that the banks require such processing fees, we suggest you try another bank ATM’s. In unavoidable circumstances, you can try to keep the number of cash withdrawals low. These fees are charged per transaction/cash withdrawal and this regardless of the draw. Thus, it is advisable to withdraw more money per cash withdrawal and therefore less often to go to the ATM. You may revoke your contractual declaration within 14 days in writing without giving reasons. The revocation period begins from the rate of receipt of your card (which is considered as the completion of the contract). The revocation request must be sent to, Advanzia Bank SA, PO Box 4108, D-54231 Trier. You can cancel the Card at any time. How to cancel the Free Mastercard Gold? The contract may be terminated by you at any time without notice and without giving reasons. If you wish to cancel your credit card agreement, please send a message (e-mail, letter) concerning the termination of your wish or send us your credit card (cut) with a covering note back. You will receive a written confirmation of the cancellation from Advanzia Bank SA. You get up to 10% discount on your Sixt Rent a Car Booking worldwide when paying with if you pay with your Free Mastercard Gold. The discount also applies to the cheap internet tariffs. You get up to 20% off at over 330 Alamo locations in the U.S. and Canada when booking with your Free Mastercard Gold. 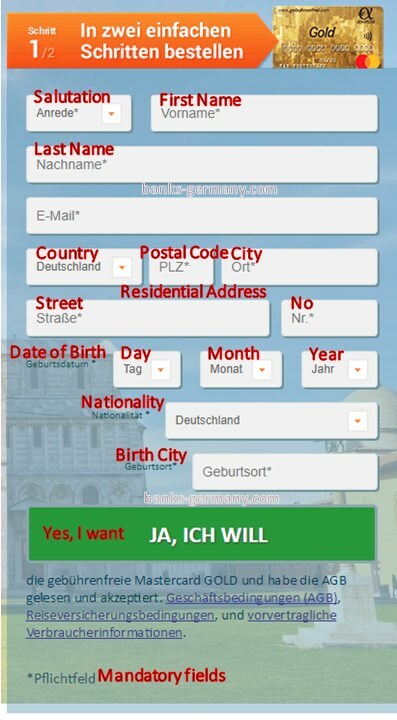 Hello sir my name is jan hakim.i am living here in worms germany.I am working as a house keeper in city hilton hotel Mainz.i want to apply for gold credit cart of your bank .how I get this credit card.the form on internet is in German language .plz kindly inform me how I apply and how I get the card of limit between 3000 to 5000 euro.i am also working with nebulingen kurire here in worms.plz inform me if I am elegebil for this card. please say me in details what i do? I want to apply gold Credit card what is the process for it. I’m really loving the free travel insurance. Thinking of signing up for this reason alone. But it’s a toss up between this one and the SunnyCard. I thought I replied to this, but my comment seems to have been lost. I personally have this card and can recommend it. The free travel insurance is great, specially for the price (free). I also like the zero foreign transaction fees since I buy on Ebay (pay in US$) and Amazon UK and do not have to pay transaction fees (it usually is 1.5% by other cards). I replied to the SunnyCard in that page. It is good, but I suppose not for the purpose you are looking for. Thanks, this was exactly why I started this website as I had the same problems when I first came here. Thanks for finding time to visit the website. Ms. Canadian Expat, how has your experience been with this card, if you got one? In a word I am very very happy with this free MasterCard Gold credit card …….!!!!! It is a great financial friend for a student…..!!! Does this card work for any kind of online transactions, such as flight bookings, hotel reservations, etc? How do you pay back ? can you set automatic payment for the end of the Credit-used month + 1.
then can have the payment done to the card from my checking account (DE based) by end of Feb (Jan + 1 months). This automatic rule needs to set so the payment back is never missed. which is well under the 7 weeks charge possibility for the card. I have had this card for about 3 years. To be honest, the system works very slow. For example, you will not receive any SMS if the cards was used; of course you can check your account from internet, but unfortunately, due to the “slow” system, you can only see your payments days later. AND, if you ague with them, where is it written that I did the transfer in seconds, but due to your slow system needs days to “confirm”, I have to be changed. the service guy will tell you, it is somewhere in their home page. If you ask where, they will tell you unfortunately you need to find it BY YOURSELF!!!!! If you can guarantee you will have no trouble for years, then it is worth a try of this free credit. IS this credit card safe ??? Thank you for the detailed information. I have a question about the payback system. I see that until 7 weeks of its interest free. I want to know what is the time limit to repay with the interest. Is there any possibility of paying a minimum amount every month and extending for a few months? Where and how do you pay the balance if you do not have an account with advanzia? pls how i can make my mastercard to work by internet ? Can I get a PPI Refund when i finish my payment and terminate the card? Hello! I just received my mastercard but still waiting for the PIN to be sent. I am really excited to use my card but somehow afraid too because i don’t have any idea how can i settle and pay my credit since i don’t have a bank account with Advanzia Bank which is the partner of the gebuhrenfrei card that i have just received. Can you please explain to me how can i settle my credit? Do i need to go to a payment center? Can i convert my purchase to EMI for 3 months or 6 Months? What will be the rate of interest in that case. EMI – Equated Monthly instalments? If I understand correctly, you want to convert your purchase into a loan with a favourable interest rate which is less than the credit card rate? No, this card does not provide it. You can pay any amount above the minimum till you finish paying the credit card, but the interest rate will be the same. Hi there.. I Have a question I live in Germany now and will travel to Spain and other countries for 6 to 9 months. I’m wondering how I pay back money to Advanzia mastercard? Is that possible I transfer money from someone eles account or I need to my bank account over these countries? As long as you have a bank account with IBAN (any EU bank), you can transfer from anywhere using SEPA. So if you have a German bank account and having an extended holiday in Spain, you can still use your German account to pay your credit card bills. You do not need to open new bank accounts in Spain. But, if you have sent a copy of the ID card and at least one deposit has been made from your own account, the further transfers can also be made from a third party account. Is this credit card provides free CDW and theft protection on car rental contracts? E.g i have a credit for 1500euro. How much do i have to pay ? Hi. I registered for the gold credit card but realised later there has been some typographic error due to the malfunctioning of my keypad. What can I do? Hi could you say for the Internet security or miss use of the card for example I live with other flatmates and if they pick my card and use it how can I protect my self against it , other thing how am I covered against fraud usage , I have not seen much about it please ? What about deposit with, for example, car rentals? Let´s say I need to keep a deposit of 500€ for one week, will the card “understand it´s a deposit or will it ask me for money? If it asks me for money, should I pay or just wait for the deposit to be canceled? And if I pay the deposit, how can I get back the money once the deposit is canceled? It would be nice if anyone can clarify me that, given this will be the main use of this card. Can I transfer my balance to a balance transfer credit card and pay my debt this way? I was asked to send by post signed activation certificate however i have not received the activation certificate. I was mailed that 200 euros limit have been approved. Please, i want to know whether the activation certificate is sent to one’s email address or to the hose mailbox. Kindly respond urgently to me question.Thanks.